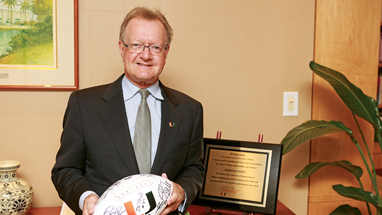 John Quelch, new dean of the School of Business Administration and vice provost for executive education at the University of Miami, said initially his principal focus is in the business school because it’s up and running and has to meet a budget, performance objectives and deliver on its mission every day. The executive education role is something new to the university. He expects to delve more deeply into that area after his first year in the business school. Mr. Quelch will also be a professor with the Department of Public Health Sciences at the Miller School of Medicine. He began his new roles July 1. Miami Today reporter Susan Danseyar interviewed Mr. Quelch on the UMSBA campus.